Instaglam is a fun clothing and accessories subscription that serves ladies size XS-3X (0 to 24). 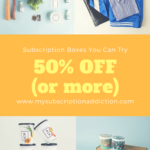 I am always so excited to discover a new subscription box that includes plus sizes! Instaglam didn’t include a detailed info card, but they did send this social media card (top), plus a note about their return / exchange policy (bottom). Short version: they accept returns (for credit) and exchanges! Instaglam sends subscribers a short quiz every month which basically asks two things. First, they give you a choice of two different tops to choose from. This was my choice, and I love it! They also ask whether you want gold jewelry, silver jewelry, or surprise. I always pick surprise. This top has short dolman sleeves and is fitted around the hips. It’s surprisingly flattering on me! I love that the tops they send out are so basic. I know I will get a lot of use out of them. This cami is meant to be worn under the top. It’s actually a pretty cute combination! The cami by itself, though, is super tight. You know if it’s tight on the dress form that it’s way tight on me! This month’s set is pretty different from previous months, and I like the variety. I don’t really like to match up my jewelry color with my clothing colors exactly, but I think these pieces could work with other items in my wardrobe, or maybe without the cami. These earrings are not super high quality, but I love the alternate take on a classic design. These are great day-to-day earrings. This is a pretty interesting and bold hinged cuff. I like it! Verdict: I have really been enjoying my subscription to Instaglam! As much as I love surprises, I like that they give me a choice in tops, and this one really works for me. The jewelry is not very high quality, but I will still probably wear everything they sent this month. It’s hard to comment on value since there were no values listed, and the pieces aren’t for sale in their online shop. I think it’s one of those boxes that you just have to ask yourself if you think what you received is worth what you paid. My answer for this box is a definite yes! What do you think of Instaglam? Did you receive the same accessories? Kind of cheap looking..easy pass. omg I LOVE that necklace!! I can’t find it online, oh well. Jen… Check out the store Charming Charlie or their website. They almost always have stuff exactly like that necklace in tons of colors! "Just an FYI. It's sold out for people who are current subscribers (no longer available in the charm room)"
"I've seen that! I think that's such a great deal! I remember the first time I heard of it was last Fall when t..."
"Love oils for my frizzy, curly hair especially when I straighten it ! Gives it a healthy glow and rocks the curl..."